Age Requirement: Children must be at least 6 years old to swim with dolphins. Children ages 6-12 must be accompanied by a paying adult who also is participating in the dolphin swim experience. Description: Make a friend that will live in your heart forever when you experience the highlight of your day, a one-on-one dolphin encounter. Learn about dolphin behavior and communication. Wade into the dolphin lagoon. Come nose to bottlenose with one of these fascinating and intelligent animals, take hold of its dorsal fin and hold on for the ride of a lifetime. 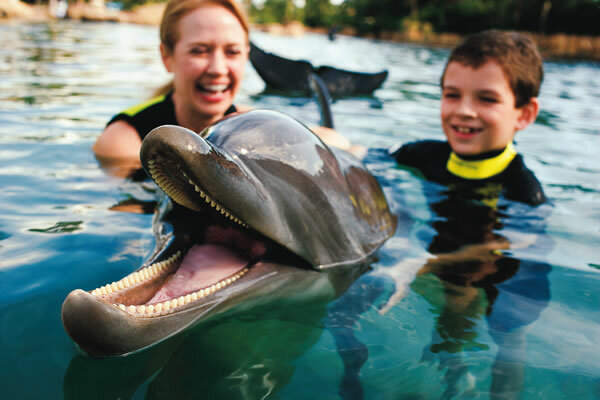 The highlight of a visit to Discovery Cove is the opportunity to swim with a bottlenose dolphin during a 30-minute interactive adventure. 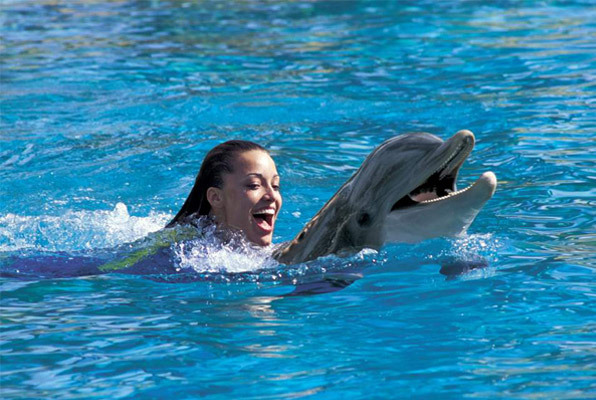 Accompanied by a trainer, small groups of guests wade into shallow water and become acquainted with their dolphin through hugs, kisses and rubdowns. Then, taking the adventure one step further, guests interact with their dolphin in deeper water for an exciting dorsal fin tow ride back to shore. Description: Venture beyond the beaches and waterfalls of Discovery Cove and enter a hidden treasure, the Explorer's Aviary, where an inspiring natural habitat sings with the rhythm of wings and the melodies of birdsong. Watch as hundreds of colourful birds soar above and around you. Feel your heart soar as a feathered friend glides in to meet you and nibble fruit from your hand. Description: Slip into the refreshing 80-degree temperature of Discovery Cove's immense and immaculate Serenity Bay. Go for a swim in this pristine pool or simply soak up the sun as you enjoy the sparkling serenity of this fabulous freshwater playground. Description: Ride the soothing currents of a tropical river as it winds past sandy beaches, through a dense rain forest, beneath the rocky terrain of cascading waterfalls, and through an underwater cave. Glance down as you travel and take in the wonders that exist beneath the surface of the crystal-clear water. Description: Now Open is Freshwater Oasis, an all-new attraction featuring wading adventures and face-to-face encounters with playful otters and curious marmosets. Designed with a rainforest canopy above and sparkling-clear springs below, Freshwater Oasis is a natural fit within Discovery Cove’s tropical vibe. You can relax and explore. You’ll wade, wonder, and float in the water-filled trails. No matter where you turn, you’ll find endless discoveries. Description: Surprises abound. Families can seek discoveries along the water’s edge or cross a bridge to see sharks swimming below. Play hide-and-seek with thousands of beautiful fish, from small colorful wrasses to velvety rays. Further out in the reef, stunning habitats create the feeling of swimming right alongside sharp-toothed reef sharks safely behind glass. You can even take paths and bridges to the reef’s islands and hidden grottos as they delve into the reef from above, around and below. 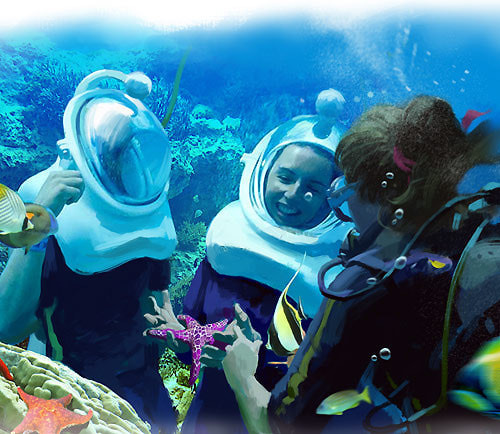 Description: The Grand Reef’s innovative experience, SeaVenture, is an underwater walking tour where, while wearing a dive helmet, you’ll feel right at home under the sea. You don’t even have to have SCUBA certification. Find up-close excitement around every corner, each step yielding a new discovery. Easily climbing down a ladder and setting foot on the reef floor, you’ll come eye-to-eye with sharks through a full, 8-foot-tall, 21-foot long panoramic windows. During the journey, you’ll experience one-on-one touches with unique animals, schools of fish and velvety rays– and even touch unique sea life found along the way. The adventure ends with schools of fish feeding around the divers with the massive open reef as the backdrop. SeaVenture is a once-in-a-lifetime, undersea experience available for a nominal fee. Some say it’s like walking on the moon – but surrounded by fish. The program is about an hour long including orientation (SeaVenture walking tour length is approximately 25 minutes) for groups up to eight people per excursion. 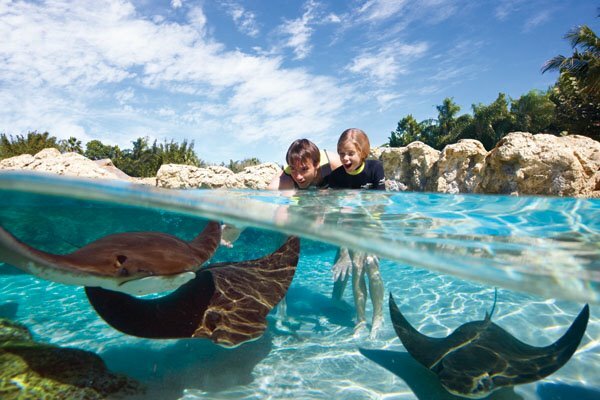 For the safety and well being of our marine friends, Discovery Cove guests may not wear jewelry (wedding sets and water proof watches are allowed). 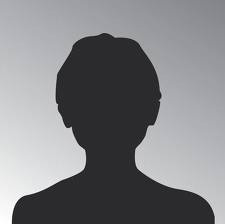 A photo ID (e.g., driver’s license, passport) is required for each party member 18 years and older. Parking: Self-parking at Discovery Cove is complimentary, however, parking admission at our sister parks are not included. Guests with Disabilities: Discovery Cove can accommodate guests with disabilities who are able to maneuver themselves with limited assistance (or with the aid of a personal assistant) during their dolphin experience and in the various wading locations. Discovery Cove also offers specially-designed outdoor wheelchairs with oversized tires for easy maneuvering on the beach. The wheelchairs are not self-maneuverable and guests will need assistance operating them. Wheelchairs can be reserved by calling 1-877-557-7404.
Review : Excellent day out. Even though it poured down with rain most of the day we had a great time. The warm water lazy river was lovely and restful too. Review : Enjoy it, I love the fact everything was included. Review : Perfect my families favourite day an amazing relaxing experience and the food was amazing. Review : Get to the park nice and early. Everything is included in the price of your tickets , breakfast, lunch, snacks and drinks the whole day. The whole day was amazing from start to finish. 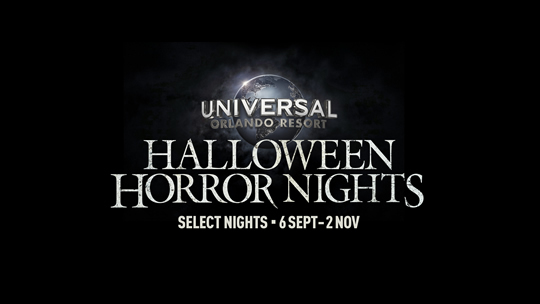 Theme Park Tip : Could not recommend orlando attraction tickets enough. Really fast delivery of our tickets no hassle.